type of fortified dwelling characteristic of the Middle Ages. Fortification of towns had been in practice since antiquity, but in the 9th cent. feudal lords began to develop the private fortress-residence known as the castle. ..... Click the link for more information. of the period. In such a fortress, peasants of the surrounding country took refuge during time of war. The early fortified château, called a château-fort, reached its culmination in the late 15th cent., when the magnificent feudal Pierrefonds was built near Compiègne. The 16th-century château, with its gardens and outbuildings, was usually surrounded by a moat, but was only lightly fortified. Notable châteaus of the transition period between the military château and the later country estate with extensive landed property are those of the Loire, Indre, and Cher valleys, such as Chambord, Amboise, Blois, Chenonceaux, Azay-le-Rideau, and Chaumont. See study by F. Gébelin (tr. 1964). 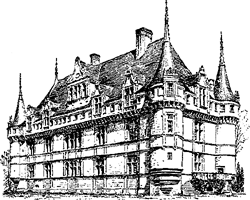 A castle or imposing country residence of nobility in old France; any large country estate. 1.A castle or imposing country residence of nobility in old France. 2. Now, any French country estate.